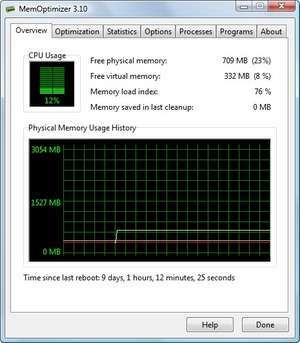 Whenever a Windows based program is running, it's consuming memory resources - unfortunately many Windows programs do not "clean up" after themselves and often leave valuable memory "locked", preventing other programs from taking advantage of it and slowing your PC's performance! Until now, The only way to free up this "locked" memory was to reboot your computer. Not anymore, with MemOptimizer™! For security reasons, you should also check out the MemOptimizer download at LO4D.com which includes virus and malware tests. Additional screenshots of this application download may be available, too. 4 out of 5 based on 30 ratings.